Cheltenham Town head into the new campaign with the possibility of fielding a team of strangers after a summer clearout at Whaddon Road. A pre-season friendly against Sheffield United saw a team of fresh faces - and 14 in total have been snapped up for their National League campaign. Just nine players remain of the squad that were relegated from League Two. 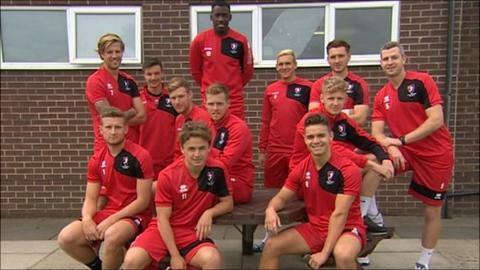 "It was a massive challenge," Cheltenham Town manager Gary Johnson told BBC Points West. Among those new players is defender George McLennan, who admitted he has been taken aback by how quickly the squad has gelled. "I arrived a couple of days after most of the lads and I didn't realise they'd signed so many players, because I thought they were all the old players talking to each other," McLennan told BBC Gloucestershire. "They seemed like they'd known each other ages. It was kind of surreal. It felt like I was coming into a team that had been together for 10 years." Johnson said change was needed after a disappointing campaign which saw the club lose their Football League status, and it has understandably been a hectic summer. "Relegation brings change," he said. "I've been very pleased with the group I've brought in. "They've gelled very quickly and also they have promoted themselves very quickly to the supporters through social media and by the way they have played in pre-season. "It was a massive challenge. You sit at home during the close season and you pick individuals out in your head but you have to believe you can turn them into a team. "What you dream is of round pegs in round holes playing the game you want, but that is not easy. "They look to be the right personality and character, they seem to be ambitious and enjoying themselves. This group want to do well." And despite the huge turnover at Whaddon Road, Johnson says the club cannot afford a season of consolidation. "The brief is promotion," he said. "That is pressure but that has given us focus. "We cannot consolidate for 108 years like Yeovil had to. We've got to do it right now."